If you are looking for a fence that beautifies, accents, and at the same time visually blends well with the environment, then ornamental fencing may be just what you are looking for. Whether you need a commercial/industrial fence to protect your business with style, or you need a classy residential grade back yard or pool fence, with an eye for detail American Fence Erectors can get the job done right with the look you desire. Whether you are looking for an ornamental aluminum fence or an ornamental steel fence, we deal with quality brands and aim to provide the service you deserve. Are you looking for a project to tackle yourself? No problem, just bring us a layout with some exact measurements and we will be glad to figure up what you need. 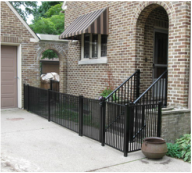 Ultra Fence is a high quality, premium product made right here in Michigan. With their many styles, durable powder coated colors to choose from, and their attractive rail profile, you will surely be happy with your fence for years to come. Ultra is available in aluminum, steel, and aluminum privacy fence. With their design studio, you can try their fence out with pictures of your own home. Try Ultra's Design Studio here. Ameristar Fence has what you need. From pools to schools, to business perimeter or high security crash rated fencing, their American made product offering will have something designed to meet your needs. Looking for a hint at where to start? Ameristar's Montage or Montage Plus are residential, welded, rackable, steel fence systems. Commercial customers try Montage Commercial or Montage II. Any of these start construction from galvanized steel and are then treated to Ameristar's multi step "E-coat" finishing process that provides that durable, long lasting finish.